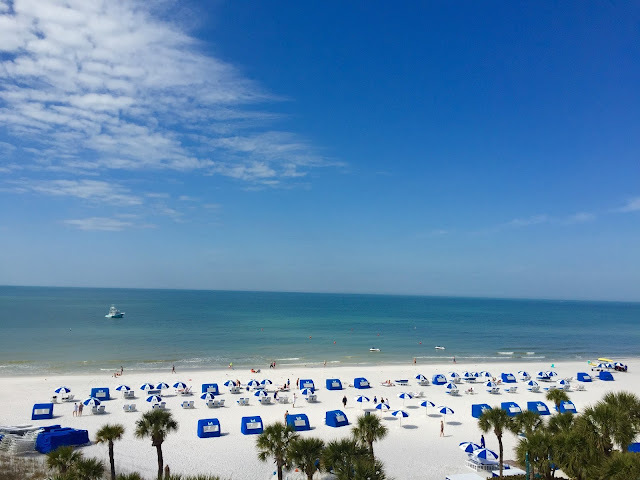 Since I am giving away a few of my favorite things over the next two weeks, it only makes sense to introduce you to my favorite place is in Florida! Loews Don CeSar located in St. Pete Beach. We are fortunate to live less than an hour from Loews Don CeSar, also known as "The Pink Palace". The Don is a historic hotel which opened in 1928. Over the years, the hotel has had many famous guests, was once home to the NY Yankees during spring training and was recently home to the filming of Bryan Cranston's Infiltrator. Although I have lived in FL my entire life, I still find myself in awe whenever visiting Don CeSar. Not only is the hotel gorgeous, it sits on Florida's gulf and has an incredible private beach. White sugar beaches, turquoise water and my favorite beach amenity ever - a beach chair with a flag to call your servers. 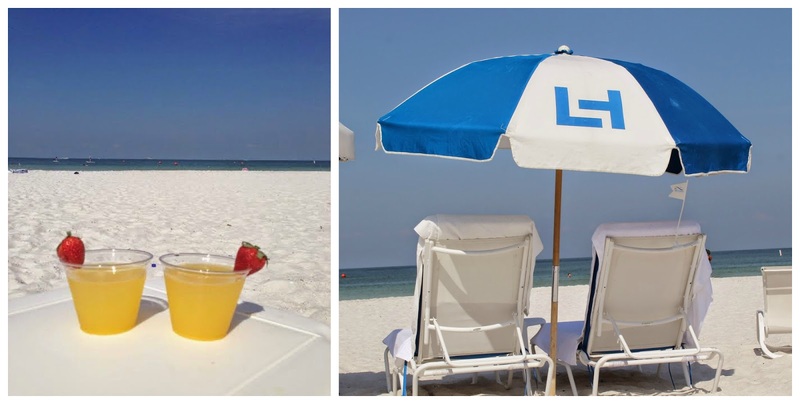 Mimosa's on the beach without having to get up? 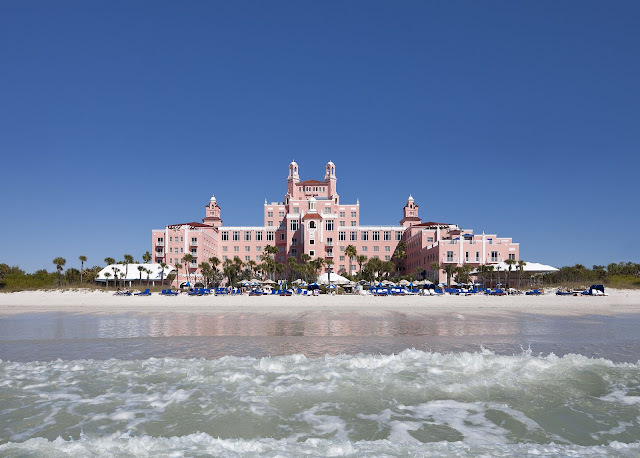 Loews Don CeSar also has a few of the best restaurants you will find in the Tampa Bay area. They have something for everyone. The foodies will rejoice at Maritana Grille where you can find tasting menu's for each season. You can opt for a more casual meal at Sea Porch. If you find yourself there at lunch, get the burger. You're welcome. Coming in 2016 and part of a $10 million dollar renovation is The Rowe Bar, named after the Don CeSar's founder Thomas Rowe. The Rowe Bar will face the gulf and have sliding doors that will open up to the beach, offering incredible sunsets! A new mixologist-inspired cocktail and seafood menu will be offered when the Rowe Bar opens to the public in January. 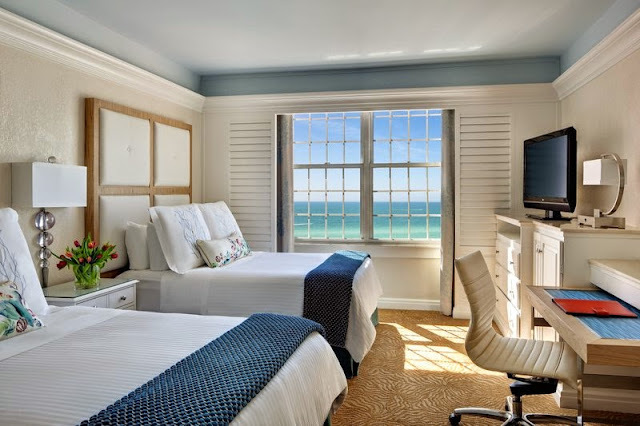 For today's Giveaway, I am giving one reader a one night stay at Loews Don CeSar and a $100 Rowe Bar gift certificate! Let me know in a comment below who you would bring to Loews Don CeSar if you won this contest. Be sure to track your entry through the rafflecopter widget below. It will also open up additional ways to gain entries into the contest by visiting Loews on Twitter and Facebook - and be sure to check out their 30 Holiday tips and tricks during the month of December! My husband. We always need a getaway. I would bring my husband. We never had a honeymoon...this would be a nice weekend getaway. A girlfriend who needed some R&R. I would bring some of my besties for a much needed girls weekend!! OH YEAH I JUST WANT THE BACON BURGER :) hahaha it looks so good. And everything else on your post too. I'd bring my wife for a beach weekend! I'd bring my husband for a long weekend! I would bring my husband!! I love this place & would make it a girls trip!! I would love to visit with my boyfriend and dethaw from DC's cold. My wife Pam, of course! Definitely my hubby! We need a night away from the children. Especially being that they crashed the last date night we planned! That's easy! I would bring my fabulous boyfriend who always does so much for me! Would love to treat him!! I would bring hubby! time for another lovely date! My Husband! I have always wanted to stay there. Thanks for the giveaway!! Ooooh, such a fun giveaway! I'd bring my husband of course for my bday next month! I always bring too much when I travel but running shoes and a swimsuit are mandatory. I would bring my husband, and probably my step-daughter, too. She loves the "sugar sand" beaches, as she calls them. I would bring my husband and kids. They would have so much fun on that beach! I drool over your pics whenever you are there.